When do you need heat/drying in the screen printing process? N.B. For printing posters and paper type flat work, you would use poster ink which is also an air dry ink. Either of the two textile inks may be used for screen printing shirts but the poster ink is used only for flat work and graphics printed on porous or glossy paper materials. You can blowdry it, or wave it in the air outside, or just let it air dry, but you should let it dry before making prints. How hot does The Cure have to be and how long does it take? Once you have finished your print, you will need to fully cure your garment. Simply drying the print does not mean that your garment is machine washable. In other words – The print will come out in the wash! The temperature must get hot enough to firstly evaporate the waterbased medium, then set the pigments. Although waterbased ink dries to air, it takes a high temperature to cure water-based inks. You can cure the ink at 165°C (some are hotter) by using a flash dryer, tunnel dryer or heat press. It can take up to 2 minutes to cure waterbased inks. If you mix a catalyst with the ink you can cure the ink with a heat gun – but remember only really suitable for cold washes. WPS waterbased inks need to be cured at 165 degrees or above. 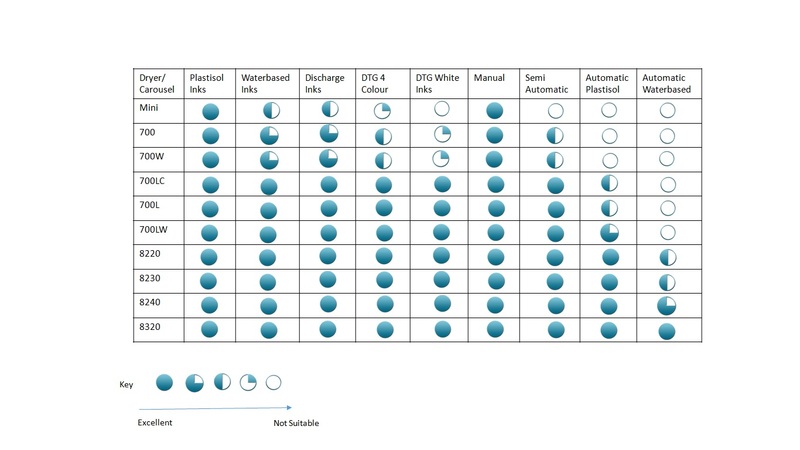 To cure your inks, you have a number of options. You can use a flash dryer, hand curer, heat press or tunnel conveyor dryer for this. If you are using a WICKED PRINTING STUFF flash dryer to cure your print, we recommend you measure the temperature of your print with a digital laser thermometer until it reaches the required temperature. Remember that it is important that the entire ink film thickness reach the specified cure/fusion temperature. Depending on the nature of your fabric it is recommended that you break this up into intervals of approximately 10-15 seconds and repeat 3-5 times as most garments cannot withstand such continuous heat in one go. If you are a busy printer, you will find that a conveyor tunnel dryer is a much quicker, more efficient and reliable way of curing prints. 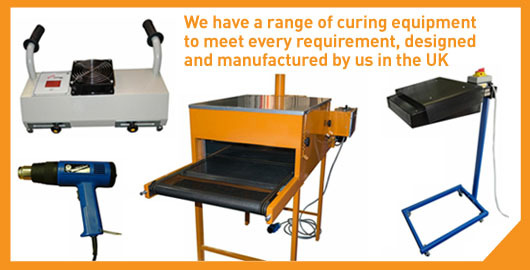 In between the application of the different colours of your design you can use a heat gun to flash dry but to fully cure you should use a tunnel dryer, flash dryer or heat press. The ink needs to get to 150°C for typically 60 seconds. Glitter, reflective and white ink can sometimes take longer. If you are printing more than one coat of ink for the same image, or printing a multi-colour image, you will need to flash cure your ink by using a flash dryer, hand curer or heat gun between each print. Flashing enables you to print one coat of ink on top of another – e.g., a color on a white base. You also might flash an ink to keep wet ink off the back of your screens. Some inks, such as glitters, metallics and high densities, are not designed to be printed “wet-on wet”. They should be “flashed” when printing in sequence. Once your print is dry to the touch you can apply your second coat or next colour. Most inks will “gel” (flash) when the ink film reaches 220°F to 230°F (104°C to 110°C). There are 3 factors that affect the “gel” or “flash” of the ink: the temperature of the flash, the distance of the flash from the printed image, and the time the printed image is exposed to the heat. As a rule, you want to flash the ink film until it is just “dry to the touch”. Over-flashing inks can cause inter-coat adhesion problems and make the inks very “tacky”. 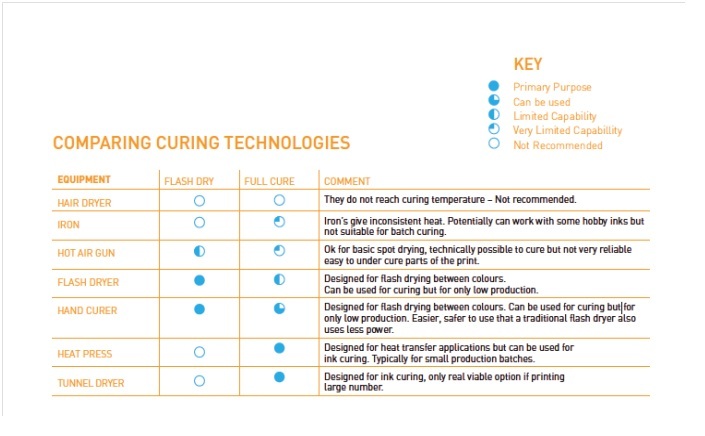 Check your flash cure unit to see if it has temperature and airflow controls. These can help you better control your flash cure process. All Plastisol inks will not air dry and will therefore need to be dried by heat equipment. Plastisol inks will also need to be fully cured at 150 (or above) degrees, which is drying them to the correct temperature and length of time (typically 60 seconds), in order for the ink to not come off in the wash. A flash dryer will dry and cure the inks in 60 seconds and for longer print runs or larger set ups, a tunnel dryer is recommended. Sun or outside clothes line – Can not be used as temperature is not hot enough. Household clothes dryer – Can not be used as temperature is not hot enough. Hand held hair drier – Can not be used as temperature is not hot enough. Commercial Dryer (Laundromat) – Not a recommended method as temperature is not accurate and time limit can vary greatly on garment type. Garments left in too long may shrink or be damaged. We manufacture the most comprehensive range of tunnel dryers in Europe ranging from the brilliant ‘Mini dryer’ to the top of the range dryers. The Mini Tunnel Dryer is ideal for the smaller workshop using a tabletop or small standalone carousel up to the top of the range WPS Panther Dryers which are ideal for screen printers with automatic presses or digital printers.